Another month slips by, another month when I’ve managed to watch films in the cinema but not to do very much about telling you about them, dear reader, so apologies. My ever demanding job has allowed me to see eleven films in the cinema this month, clumped into three or four groups when I could spare the time, and has spanned both a triple bill in Norwich (90 mile round trip) and a late night visit to Ipswich (80 mile round trip) but it’s been a mixture of late screenings, with just one film seen on a midweek evening (when normally I’d manage one a week). In all that time, I’ve not had time to write any blog posts, which is even more of a shame given that the overall quality of the films I’ve seen in the first four months of the year. 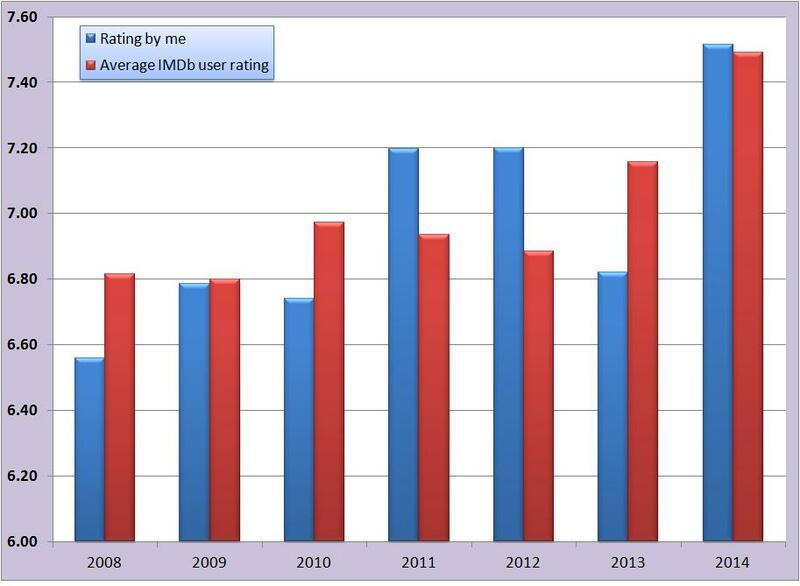 The graph below shows my average rating for films in the first four months of the year over the last seven years. This year I’ve managed only 35 films in the first four months (compared to a peak of 51 in 2011 and 39 by this time last year, but the overall average rating – both by me and by all users of IMDb, to prove it’s not just my own personal taste) have reached a satisfying peak. But sadly I’ve been so busy for work I’ve not had chance to tell you that Under The Skin was completely strange, utterly bamboozling and I’m still thinking about it nearly a month later; I’ve not found the time to tell you that Calvary was a devastating and though provoking follow-up to John Michael McDonagh’s superb The Guard, but with a much darker sensibility. You won’t have heard me say that while Asghar Farhadi’s The Past was more drawn out with a slightly weaker ending than his last three features, it’s still better than the output of the majority of western directors and he’s shown he’s as capable outside Iran as he is within it. Nor have I been able to tell you how much I thought of Richard Ayoade’s sophomore film The Double, or that The Raid 2 ups the stakes on its predecessor, with something resembling a serviceable plot this time and actions scenes that will blow your mind, the car chase alone worth the price of admission. You could at least find the latest Bums On Seats podcast at Cambridge 105 or on iTunes and hear me rave about Joanna Hogg’s thrilling and slightly eccentric Brit flick Exhibition. But you might have to wait until next month before you get an actual review from me – I’ve got a half written one for Transcendence I hope to share with you, along with my crushing disappointment, very soon. But despite getting to 11 films this month at odd hours, I’ve still managed to miss out on a few that looked interesting. From the Biblical epic of Darren Aronofsky to the latest from Xavier Dolan and a series of James Dean re-releases (never seen any of them, to my shame), these are the six films I’d love to try to catch either in May or before the year is out. This entry was posted in Evangelism and tagged 2014, films, movies, Noah, Rebel Without A Cause, review, The Half Dozen, trailers.